To coincide with the release of our 2015 “Le Sweet”, we’ve put together a guide to how sweet wine is made. The basic idea is to increase the sugar concentration in the grape juice, such that as the wine ferments, some of the sugar, but not all, turns to alcohol. The residual sugar then gives the wine its sweetness. 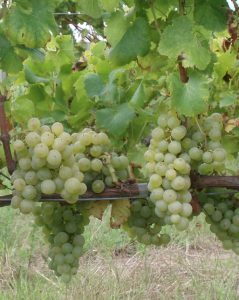 For example; in a dry white wine, the grapes are picked when the amount of sugar, measured as potential alcohol, is about 12 – 13%. All that sugar turns to alcohol, so the result is a wine at 12 – 13% with no left-over sugar. In other words, dry. For a sweet wine, however, the sugar needs to be at a level of between 15 – 25% potential alcohol, so when our 13% is turned to alcohol, there is enough sugar left to give the required sweetness. Ice wine, where the grapes are left to freeze on the vine, which concentrates the juice. The grapes are often pressed whilst frozen. This is common in Canada, and some colder parts of Europe and China. Difficult to make, and is of high quality and high price, normally. Fortifying the wine, which is simply adding sugar to dry white. This can be made anywhere, and tends to be for the cheaper wines – it adds sweetness but no complexity or character. Raisin wine, where the grapes are left to dry and shrivel, concentrating the sugar content. This method originated in Roman times, and nowadays in Italy is known as Vin Santo. It can also be found in the Jura region of France where it is known as Vin de Paille, named after the straw mats used for drying the grapes. Noble rot wines, where the grapes are left to over ripen on the vine, and the changing weather conditions in the Autumn cause rot to develop – just the right combination of sun and damp and you get the precious noble rot, which reduces the water content and adds complex flavours, such as apricot and honey. Too wet, however, and the grapes just rot away, so location is very important – best would be a South facing hillside overlooking a river or stream. 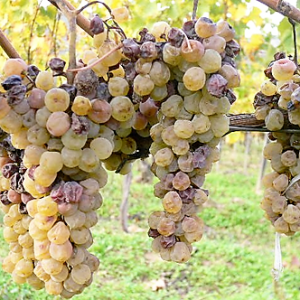 The world’s most famous sweet wines are noble rot, for example Sauternes (just down the road from us here at Chollet), Tokaji in Hungary, and German Trockenbeerenauslese (try saying that after a few glasses). Here at Chollet, being positioned in between Sauternes and Monbazillac, another good ‘noble rot’ zone, we have the right climate and South facing slopes, so we use this method. 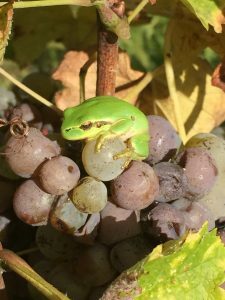 As well as relying on the weather, the vines need to be handled differently during the season, notably early ‘leaf pulling’ to allow the grape to better prepare for the longer ripening required. Typically, we would pick our white grapes for dry white in the first or second week of September, and for sweet a month later – sometimes even the beginning of November if the weather allows. For the harvest of sweet wine grapes, the key is selection, as not every grape will be good. Often, several harvests will be required – first pass in October when the first noble rot develops, then a second and third pass over the following couple of weeks. Yields are also tiny, as there is that much less juice and not all the grapes are used. The above grapes are ready to pick for dry white in early-mid September. No rot as that is not desirable for dry wine which needs around 12.5% of potential alcohol with good freshness and acidity. The picture on the left shows noble rot developing on some grapes, normally around early October. These grapes are good for sweet wine, but could either be left on the vine for a few more days, or picked now for the juice content and acidity. 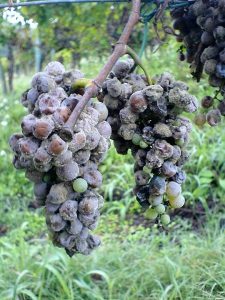 In that case, we would return later for the more concentrated grapes, as in the second picture, which shows noble rot developing on all grapes – now is the time to pick as these may disappear altogether if left out there, in particular if it rains. As many bunches as possible like this is great for sweet wine. Below, nicely rotten grapes with added wildlife! Once the grapes are picked, they need pressing. For that, we use a basket press, which gently squeezes out the precious sweet juice. It looks awful at this stage, a murky brown colour, but quickly settles once in the tank, at which point it is run off (separated from the heavier stuff we do not want) and put in the tank or barrel for fermentation. 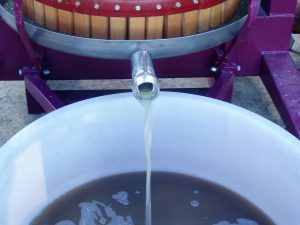 For a sweet wine, fermentation is often problematic due to complex sugar polymers released by the noble rot which do not always react correctly with the yeast. To counter this, the juice needs to be at just the right clarity and temperature, and some yeast is also added. Once fermentation is going, it is important to monitor it as these same substances can lead to a build-up of volatile acids later on, and we also need to stop the fermentation at the correct point (when the right amount of sugar has converted to alcohol), either by quickly cooling the wine, the addition of sulphites or filtering out the yeast. All in all, sweet wine is expensive and tricky to make, but an interesting challenge for a winemaker. If you do buy any of our “Le Sweet”, whilst you sip you can think of those lovely rotten grapes!